ACP membership provides access to valuable clinical and professional resources, nationally respected publications, quality education, powerful advocacy, career management solutions, practice improvement, and networking within a community of over 12,000 members in New York and 154,000 members nationwide. plan with alternative therapies, as well as how to assess for and treat opioid use disorder. Opioid Risk Management helps to assess your practice’s ability to successfully develop a treatment plan for chronic pain and track and monitor opioid use if prescribed. 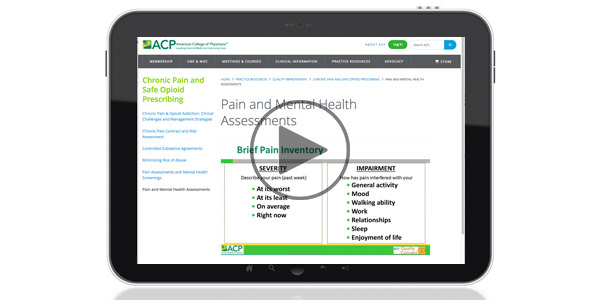 In this FREE video from ACP Quality Connect, learn why we should assess both pain and mental health. Then identify tools to assess pain, including the Brief Pain Inventory (BPI). DynaMed Plus has been redesigned from the ground up for busy clinicians, focused on providing a comprehensive clinical decision resource and optimized to deliver the fastest time to answer possible. Content is written by a world-class team of physicians who synthesize the evidence and provide objective analysis. Daily updates ensure you are always getting the most current information available. Precise Search Results mean clinicians get relevant search results every time. 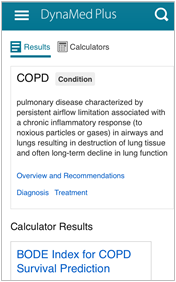 The redesigned search delivers a high level summary of available clinical information enabling you to quickly access your area of interest. An Image and Calculator filter is also available to further customize the search results. Overviews and Recommendations provide clinicians with concise, accurate summaries for the common conditions as well as evidence-based recommendations for patient care. Expert Reviewers are an integral component of the DynaMed Plus editorial process. Subject-specific experts review topics using the DynaMed Plus proprietary evidence-based methodology and quality assurance processes. Comprehensive Specialty Content includes thousands of topics covering emergency medicine, cardiology, oncology, infectious diseases, pediatrics, obstetrics and gynecology and much more. Mobile Optimized web design displays the content in a user-friendly format from a PC, smartphone, or tablet. Free Mobile App provides ability to access information offline, write and save notes, bookmark favorites, and email topics (iOS and Android available). Micromedex® Clinical Knowledge Suite includes drug content such as drug dosing, interactions, off-label uses, and lab recommendations (select products only). Annals of Internal Medicine publishes original research, review articles, practice guidelines, and commentary relevant to clinical practice, health care delivery, public health, health care policy, medical education, ethics, and research methodology. A subscription to Annals is an important benefit of ACP membership. Members receive full access to the digital editions, free Annals iPad app and/or print. Members also receive access to Annals-related CME/MOC. A subscription also includes two regular monthly features: (1) In the Clinic and (2) ACP Journal Club. Point-of-Care CME - Earn FREE point-of-care CME credit simply by reading Annals articles online. Shape your educational experience with self-directed learning about topics that are most relevant to your practice. Read the articles and answer 2 multiple-choice questions about how you will use the information in patient care and earn CME credit. Annals Consult Guys Videos - Watch entertaining videos on vexing questions in medical consultation and earn FREE CME credit. Tune into a new episode each month! Annals Beyond the Guidelines - This multimedia educational series is based on Grand Rounds sessions at the Beth Israel Deaconess Medical Center. Earn FREE CME credit and MOC points. Help your patients with their health management goals. Co-developed with Consumer Reports, ACP's "Take Control of Your Health" guide helps to facilitate effective patient-physician communication about maintaining healthy blood sugar and blood pressure levels, needed vaccines, screenings and medicines, and choosing a healthy lifestyle. Browse ACP's Patient Education Center for hundreds of other patient-centered education materials. The Center contains free guidebooks, fact sheets, videos, and other materials that promote understanding and self-management of common health conditions. All resources are written at or below a 6th grade reading level, and most are available in both English and Spanish. Guidebooks - Easy to read books offer practical tips for managing behavior change, leading to improved health outcomes. Note: ACP's "Living with Diabetes" Patient Guidebook was updated in November 2017 and is available in English and Spanish. Also, for more diabetes patient education resources, visit ACPOnline's Patient Education Center. Patient FACTS - Simple information sheets that help patients understand common conditions. The Wellness Network Partnership - Free access to a NEW Patient Education Video Library. Also available: FREE Health TiPS, Videos and DVDs in a wide range of topics. Easy-to-read tips explain how patients can protect themselves. Written at or below a 6th grade level. Other vaccines covered in these resources include pneumonia, chickenpox, shingles, and more. Physician Guide on "Aging and Immunity: The Important Role of Vaccines"